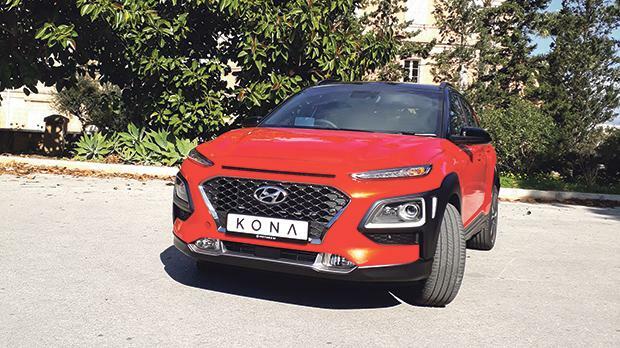 For a carmaker that presents itself as a safe bet, Hyundai has been successfully adventurous with the new Kona, says Pierre Fava. Performing a road test on this very new model from Hyundai even before it was presented to the public and press was an opportunity not to be missed. It is very clear that Hyundai’s intentions were to have a clear alternative to mainstream crossover models coming from other big brands such as the Renault Captur, Nissan Juke and Opel Mokka X, just to mention a few of the choices available in this segment. But what Hyundai has managed to do is give this car a particular twist, an edge so to say, over its rivals in that it wanted to be bold and innovative. I must admit Hyundai managed to do so with significantly admirable results – and this for a carmaker that presents itself as a safe bet, a car that is neither too modern nor too mainstream. This can be seen from its current line-up of models. So has this South Korean giant veered away from its normal product offering? I dare say yes and with very successful results. To begin with, the Kona rides on an all-new platform and not one that is used for other models. This gives rise to new dimensions and a totally bold new look. The wheelbase is built to accommodate the possibility of four-wheel drive and also a battery pack. This means that the current line-up may be updated further. This on its own goes a long way in stating that Hyundai is looking further ahead with the Kona and well into the future. The engine line-up has both petrol and diesel alternatives ranging from 118bhp 1.0 turbo triple cylinder and a four-cylinder 175bhp 1.6 turbo to the two diesel engines of 116bhp and 134bhp. This car really wants to be liked not only for the exterior and interior but also for what is available under the bonnet. 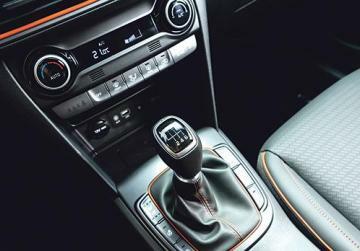 The car comes with a six-speed manual gearbox driving the front wheels. The 1.6 is limited to the higher trim levels and in the near future will also be available with an on-demand four-wheel drive set-up. This version will come complete with a differential lock and electronic hill-descent control and will also be equipped with a seven-speed dual clutch automatic. This all-wheel-drive Kona also has a multi-link rear axle, with the 1.0 litre’s rear end suspended by a coil-sprung torsion-beam axle. This suspension layout results in a very composed ride which will not be easily upset with our abnormally bumpy roads. There are five trims to choose from: S, SE, Premium, Premium SE and Premium GT. The entry-level models get 16-inch alloy wheels, electric windows, hill start assist and lane departure warning as standard. 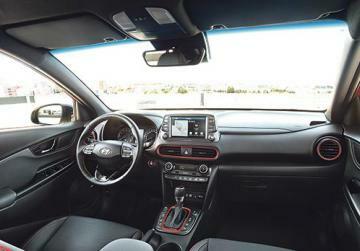 On the inside the car comes equipped with air conditioning, tinted rear windows, Bluetooth and USB connectivity. Upgrade to SE and you will get 17-inch alloys, roof rails, rear parking sensors, rear view camera and smartphone integration. While the Premium trimmed Kona would have 18-inch alloy wheels, a skid plate, climate control, auto wipers and lights, and keyless entry and start, the Premium SE model packs electrically adjustable and climate controlled front seats, leather upholstery, folding mirrors, a heated steering wheel and front parking sensors. The range-topping Premium GT Kona is equipped with a host of safety equipment and LED headlights. Hyundai has worked hard to have a car that suits as many tastes and needs as possible. Hyundai has also presented the car in a range of very bright and modern metallic paints. I must admit that some, like the bright burnt orange metallic, are not suitable for the faint hearted. That said, these colours do suit this car very well and would not fail to make an impression. Making it very obvious and evident which kind of market the Kona is destined to serve, the car comes with a heavy serving of both electronic and connectivity features. There are five-inch, seven-inch and eight-inch infotainment displays according to trim level, with the base option including Bluetooth. The larger touchscreens provide a reversing camera, Apple CarPlay and Android Auto, while the eight-inch screen has navigation and a seven-year free subscription to real-time traffic, weather and speed camera location updates. All this and the high riding seating position together with the very up-market soft feel dashboard makes this a very driver-friendly car. Unquestionably the Kona is a leading contender in the crossover segment, not only because it is very attractive to look at but also because it delivers state-of-the-art security and entertainment features that are available on more expensive up-market alternatives. The Kona is destined to be a winner and a most welcome addition to any home or office fleet.